On trips out west over the years, while heading into Yosemite National Park from Lee Vining, we would pass Tioga Lake campground near Tioga Pass, but never stopped there. 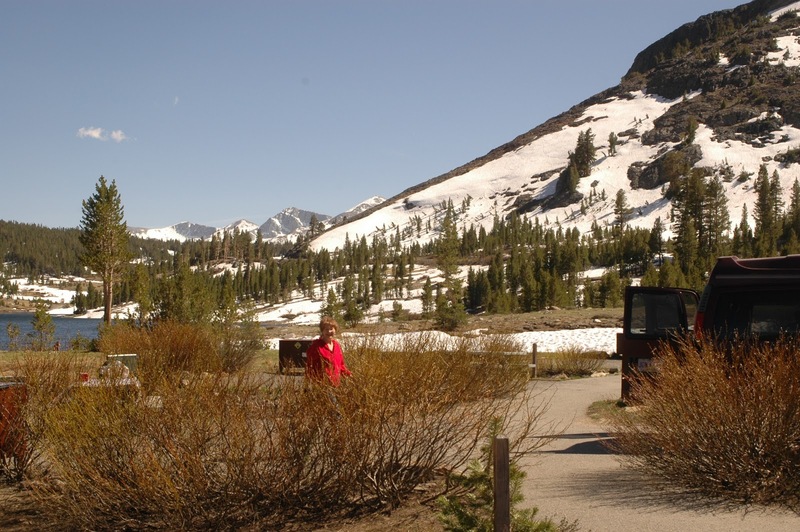 On our last trip out west, our destination for the night was Tuolumne Meadows campground in Yosemite. It was about the second week in June and we figured it would be open. That wasn't the case. The snowmelt had left the area rather damp and it was closed. We hated that. Some 25 years earlier we became acquainted with Tuolumne. It was the location of I guess the best campfire program ever. The ranger started the fire in a traditional manner, telling a story as he proceeded to light small tinder. As the fire began getting a little bit bigger, he added slightly larger limbs and then even larger ones until he had a ranger-approved roaring blaze. My wife and, our only son at the time, sat around and listened to his mountain tales. And we joined in with everyone else in singing that song about the woodchuck - "How much wood could a woodchuck chuck if a woodchuck could chuck wood." Those attending the program were broken up into groups and sort of had a competition with the song. It was a truly great time and we were looking to another enjoyable experience on our latest visit. 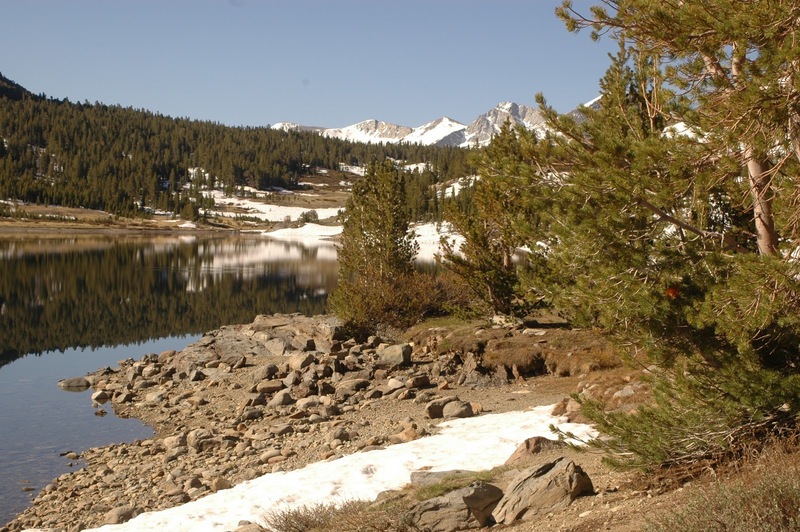 With Tuolumne closed and knowing there wouldn't be any campsites available in the valley floor, we quickly retraced our steps and headed back toward Lee Vining. Although there are only 13 sites at the Tioga Lake campground, about a mile outside the park, we managed to get one. It was early in the day and we had our pick of the eight or so sites left. By the time the sun went down, the campground was full. We slept in our van and fixed our meals outside on the table that was provided. Bear-proof containers were available for storage. 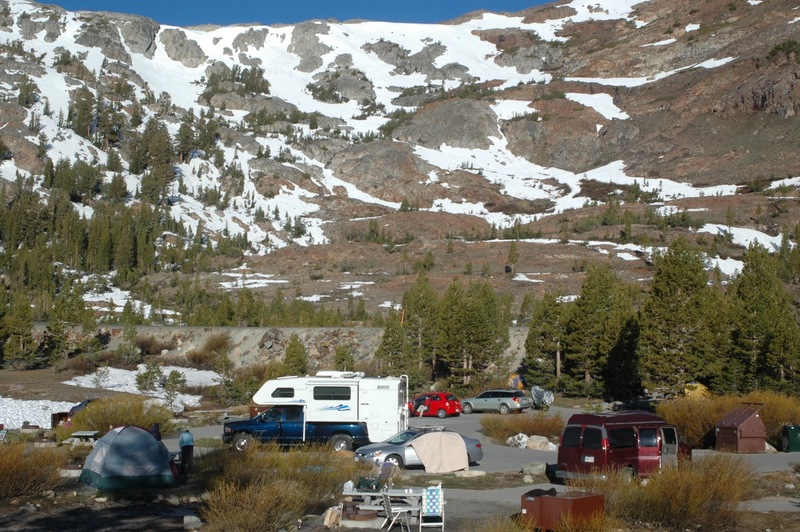 The view from our site was beautiful, surrounded by the mountains, and even though it was June, there was still snow. 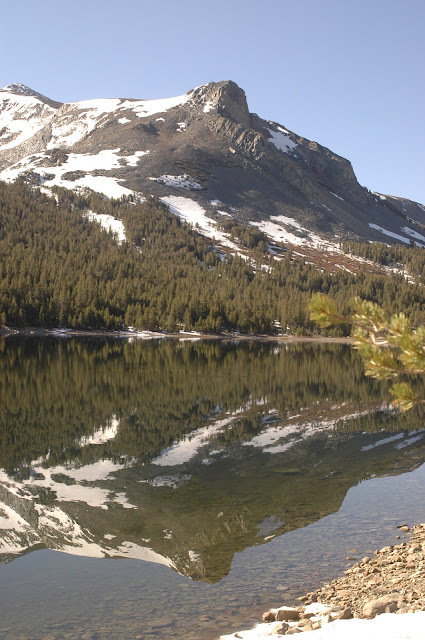 At an elevation of 9700 feet, the temperature that night dropped down below 32 degrees since the next morning we found water frozen that had been left in a milk jug. We had all the requisite cold weather camping gear and clothes and slept comfortably that night. It was a little slow the next morning, having to get out and get adjusted to the temperature. Sure enough, when we got down to Yosemite Valley that day, we checked to see if any campsites were available, but to no avail. Although the June crowds were getting bigger, we did manage to do a little touristing before heading out in late afternoon to continue our adventure to the Coast.